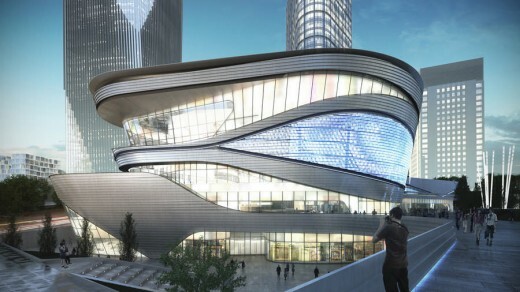 SPARK’s playful Clubhouse in Chongqing has opened to the public. The Clubhouse is the first part of a series of leisure facilities SPARK designed for a large villa community in the outskirts of Chongqing. Apart from the 5,500 sqm clubhouse SPARK’s masterplan proposal includes a 12,000sqm hotel and a 13,000sqm outdoor retail street which will be completed early 2013. ”The uniqueness of the site was the source of inspiration for our design”, says Jan Clostermann, Director at SPARK. The design aims to embody the site’s steep topography, beautiful greenery and scenic views in the spatial experience of the architecture. 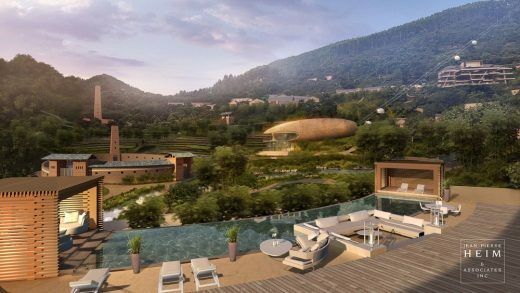 The hotel, clubhouse and retail elements become part of a scenic route from a panoramic lookout fifty meters above the community down into the valley. Along this dramatic descent program has been carefully placed to respond to the topography and community needs. Thus, in the process of meandering through the landscape, one engages in activities that foster a healthy community and social interaction. The clubhouse forms the centre point of this leisure route. It functions as a mediating icon that brings residents, visitors, and all the elements of the master plan together. It was formally conceived as a continuous folded loop that pivots from a common double height space. 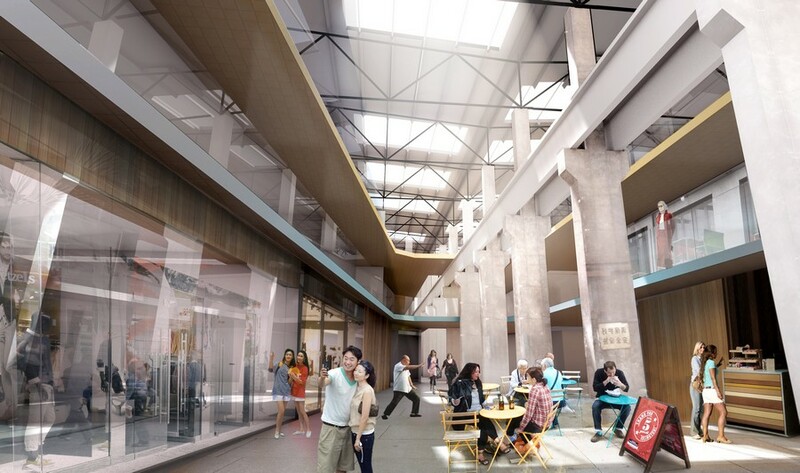 The common space links together the different programmatic elements of the building; including a gym, a swimming pool, children playground, offices, arts-and-crafts classrooms, meeting rooms, a restaurant and a café. The design responds to the client needs by allowing this common space to be temporarily utilized as a showroom and sales floor for the villas. Surrounding the clubhouse is a shallow reflective lake abundant with carp and lotus. 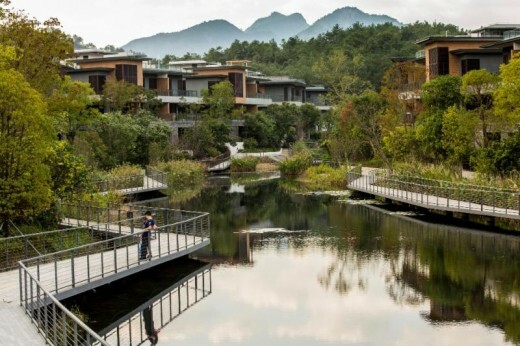 Wooden platforms outline the periphery of the building and bridge across the lake to connect the lobby with the residential villas. Like the hotel and the retail street SPARK aimed to embed the clubhouse into the existing topography. There is a 5 meter level difference between the side facing the street and the side opening up to a shallow lake. The roof folds down towards the main entry forming outdoor seating continuing the scenic route along the roof down towards the water. Thus the clubhouse seems to grow from the ground when approaching the main entry, and rising out of the reflecting water surface five meters lower on the opposite side of the building. This terraced space is echoed in the interior spaces where the visitors enter into a low ceilinged space to descend into the double height space that is now used as the sales room. The materiality aims to blend the building into its natural setting by employing is a simple palette of textured granites and glass. By embracing the existing topographic conditions and integrating the water edge to be one of the main features of the design, SPARK has created a memorable indoor – outdoor experience for both residents and visitors alike.